Former CCFC Scholastic Director NM Daniel Lowinger returned to the club for a weekend visit. In tonight’s quads he and NM Yoony Kim tied for first place with 2.5/3 each. 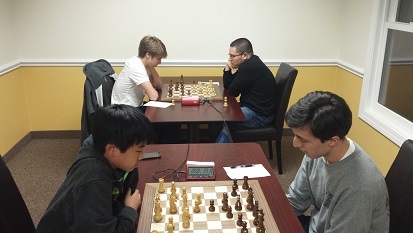 Brent McCreesh, Ramesh Abhiraman and Luis-Jaime Casenas all tied with 2/3 each in the six player swiss.